Things have been busy here as per normal. We are shifting gears from our end of summer routines to the preparation for winter. As stated previously we are preparing for deer season. It is a family affair that’s more involved than just putting up a couple deer stands. One of the preparations is the readying of the utility room for meat processing. Last Friday night found us bottling the remaining buckets of honey to free up space for for this task. During summer the utility room is used for storage of fresh produce prior to processing as well as a cooling area for canned goods. Our dehydrator is a constant fixture in that room as well. After honey extraction the utility room is where buckets of honey are stored prior to bottling. The house is heated via a boiler that is located in the utility room. Therefore it is normally the warmest room in the house. I try to keep the honey buckets as warm as possible to decrease the likelihood of crystallization. Crystallization of honey is the result of several factors so keeping the buckets warm does not always prevent it. That being said two full buckets (120 pounds) of honey had at least some crystallization. I have been researching different methods of melting the crystals. Currently there is an ongoing experiment involving the food dehydrator to get rid of them. The dehydrator has adjustable temperature and a timer. It is a tricky business, not hot enough and the crystals will remain, too hot and the honey will be degraded to something I don’t want to consume or sell. Preliminary results are looking good. More on that later. I am aware that crystals won’t hurt anything, but my customers like their clear liquid honey. This has given me an idea to keep better track of where each bucket comes from. The crystallization has only affected some of the previously bottled honey. I noticed during extraction that honey from different hive sites had different properties. Some lighter, some darker and some that had subtle taste differences. I have a suspicion that the crystallizing honey came from certain apiaries because they had access to slightly different floral sources. I didn’t keep good enough track of this information this year, but will in 2013. What do you do when your honey crystallizes? What temperature do you heat it to and for how long? 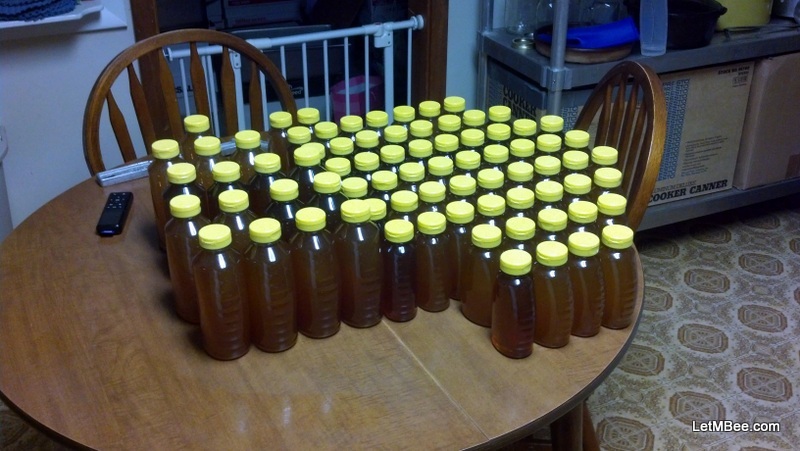 This entry was posted in Experiments, Honey, Posts and tagged bee, beekeeping, crystal, honey, Indiana Beekeeping. Bookmark the permalink.